Traditional washoku cuisine is catching on abroad, yet in the country of its origin its future prospects are not so tasty. Seasoning makers, who create key ingredients for washoku, have apparently come up with a solution: initiate children into the world of washoku from early on. The companies are offering to send representatives to visit elementary schools hoping that they will increase children’s familiarity with traditional seasonings as they struggle against the continuing Westernization of culinary life. 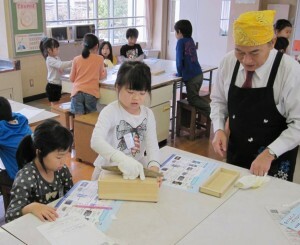 Meanwhile, schools are embracing this gastronomical initiative as an opportunity for children to think about the importance of food while learning the washoku tradition. washoku and the different seasonings commonly used in Japanese cuisine. 2. How is washoku different from other countries’ cuisine? 3. Why is western cuisine now becoming more popular in Japan? developing a certification system for chefs at Japanese restaurants abroad. They also hope to expand exports of Japanese farm products and seasonings.